Wolfgang Uber Compound 3.0 128 oz. 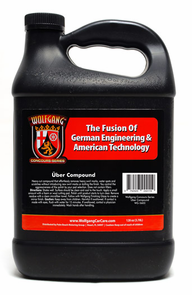 Home > Shop by Brand > Wolfgang Concours-Series Car Care > Wolfgang Uber Compound 3.0 16 oz. > Wolfgang Uber Compound 3.0 32 oz. > Wolfgang Uber Compound 3.0 128 oz. 128 oz.8 oz.16 oz.32 oz. I first saw this product demo'd at SEMA and was impressed with the results. I purchased a quart to try and realized I should have just purchased a gallon. I used it on new paint with excellent results. But what it could do for old paint was amazing. I used it on a 99 merc that had never been garaged. The worst water spots,(craters) were reduced buy wetsanding with an abralon 3000 grit pad. The Uber compound removed 95% of the 3000 scratches in the first compounding. The shine was great. Followed up with Uber glaze and no scratches and no swirls. A beautiful finish. The 99 looks new. The majority of the car was just compounded and polished. This is my go to compound. ProsOne compound takes you from wetsanded scratches to a good shine. 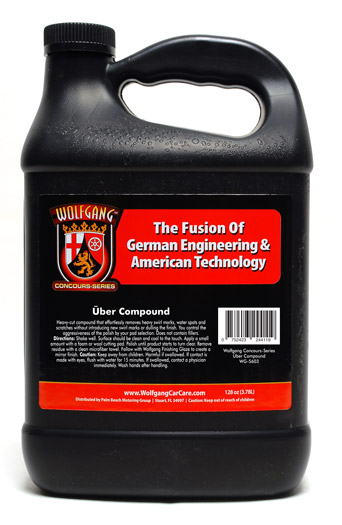 Related Items - Wolfgang Uber Compound 3.0 32 oz.